The qualifying round begins on Friday, 21 October 2016 and ends on Friday, 11 November 2016. After this date, no further entries will be permitted. The qualifying rounds are held at BERING stores located at, NEX, Suntec City, The Shoppes at Marina Bay Sands, VivoCity and Westgate. During the above-mentioned times, participants are required to twist 7 different ring combinations in the fastest time possible. Multiple attempts are welcomed but only one timing per participant will be accepted. Participants who achieve a timing of below 1 minute during the qualifying rounds will receive a BERING keyring. 10 semi-finalists will receive a BERING travel backpack and colour changing mug. 1st prize: $500 BERING voucher and $1000 travel voucher fully redeemable at www.hutchgo.com.sg. Valid from 20 November 2016 to 19 November 2017. 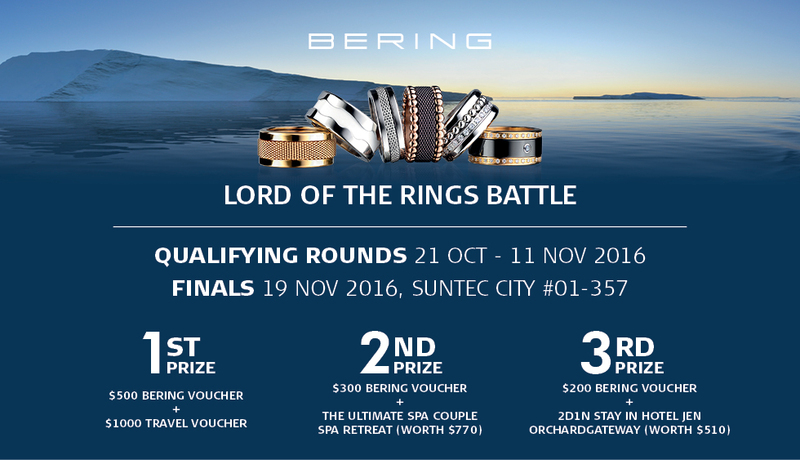 2nd prize: $300 BERING voucher and The Ultimate Spa Couple Spa Retreat (worth $770). Valid from 20 November 2016 to 31 August 2017. 3rd prize: $200 BERING voucher and one (1) night stay in Hotel Jen Orchardgateaway Club Room for two (2) person inclusive of Club Benefits and Daily Breakfasts (worth $510). Valid from 20 November 2016 to 19 November 2017, not valid on the eve and public holiday. This competition is open to anyone based in Singapore and aged 18 years or over, except employees of Norbreeze Group Pte. Ltd., their partners, families, agents or anyone else professionally associated with the draw. Top 3 winners will be chosen and announced during the finals on 19 November 2016 by Norbreeze Group Pte. Ltd and prizes can be collected on the event day. Norbreeze Group Pte. Ltd. reserves the right at any time to cancel, modify or supersede the competition (including altering prizes) if, at its sole discretion, the Lord of the Rings competition cannot be conducted as specified. Norbreeze Group Pte. Ltd. reserves the right to substitute any prize for another prize of equal value in the event that circumstances beyond its control make this unavoidable. Any questions, comments or complaints regarding the Lord of the Rings competition must be directed to Norbreeze Group Pte. Ltd.. Any dispute arising from, or related to, these Terms and Conditions shall be subject to the laws of Singapore, and the exclusive jurisdiction of the courts of Singapore.